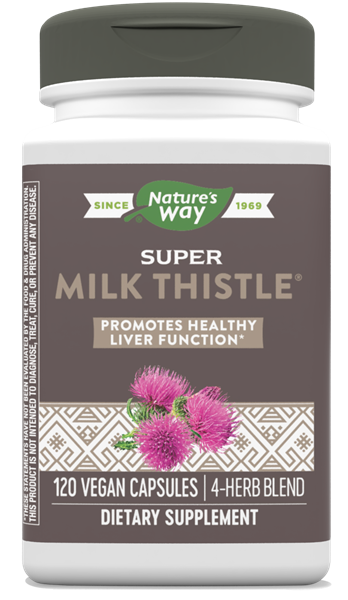 Super Milk Thistle® / 120 Veg Caps - Nature's Way®. Because you need to support liver health. * Most of the time, you may not be thinking about liver health, but it covers some of the most important duties in the body, including metabolizing carbohydrates, storing and synthesizing vitamins, regulating hormones, and creating bile to break down fats and help shuttle toxins out of the digestive system. Caution: Do not use this product if pregnant or nursing; have high blood pressure, cardiovascular disease, gallstones, intestinal obstruction/inflammation or bile duct obstruction. Do not use if you have allergies to plants of the Asteraceae (Compositae) family including ragweed. If you are taking any medications or have gastrointestinal disease, consult a healthcare professional before use.